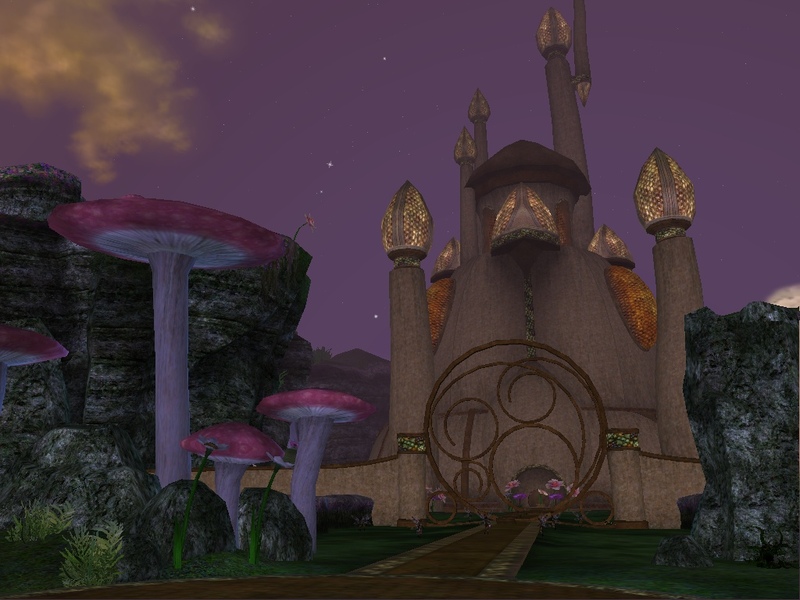 In the wilderness east of Blightfire Moors is the Stone Hive, home to the bixies of Norrath as well as many living mushrooms and shrubs. 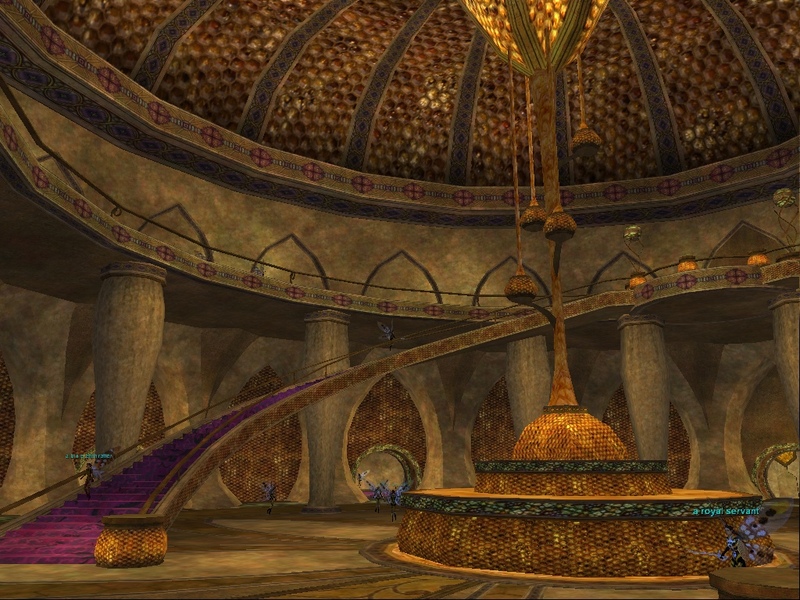 Sitting in the center of a gigantic garden, the Stone Hive is one of the more impressive sights in the mountains of The Serpent's Spine. After Innoruuk intervened in the war of Kithicor, the forest's plantlife became tainted with his magic. 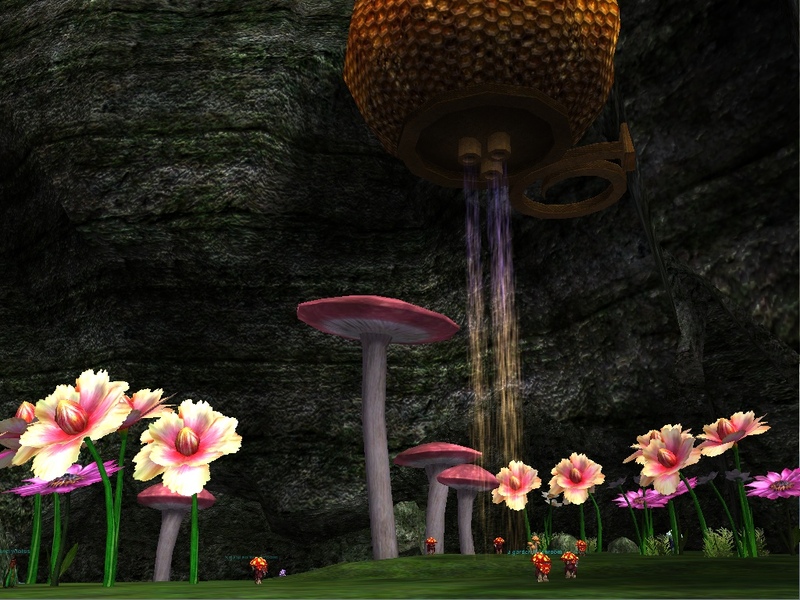 Among the forest's tainted plants are the jumjums, the bixies' food source. As the bixies consumed the tainted food over time, they changed (many would say improved), becoming the physical and intelligent force they are today. 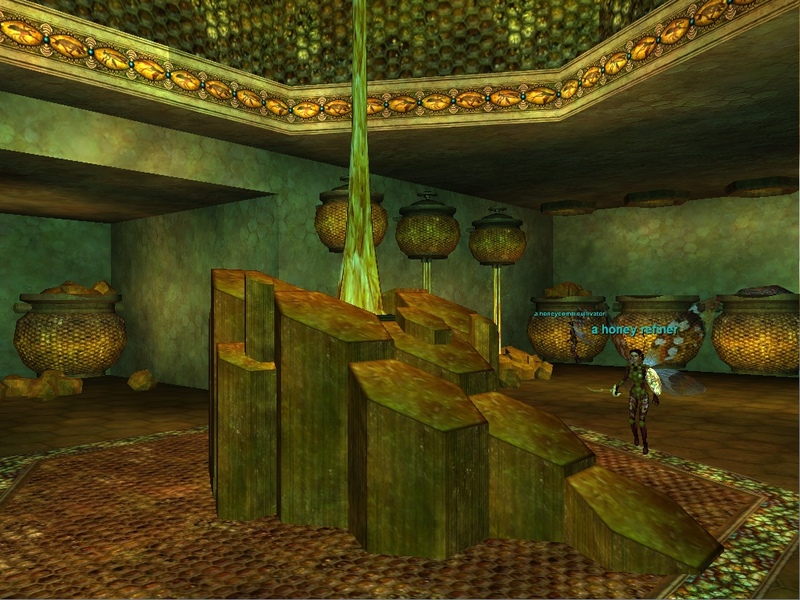 There are three floors inside the Stone Hive. The main floor acts as a lobby of sorts and has a lift used to reach the second floor. On the second floor are the honey refinery and slave prison, as well as a lift to the top floor, where the royals may be found. Pelzia, the queen of the bixies, flutters alongside her adviser, Vaxa, and numerous royal bodyguards. Down the hall from Pelzia is the bixie council, led by their commander Neezzee. Beneath the Stone Hive are a small network of darkened tunnels, inside which are skeletons, spiders, and psychotic thralls -- slaves who perhaps escaped their bixie captors and lost their way in their effort to flee. Recommended level of 40. Required level of 26. Recommended level of 33. Required level of 26. Showing 25 out of 117. Click here for the full list. Recommended level of 35. Required level of 28. Recommended level of 35. Required level of 26. 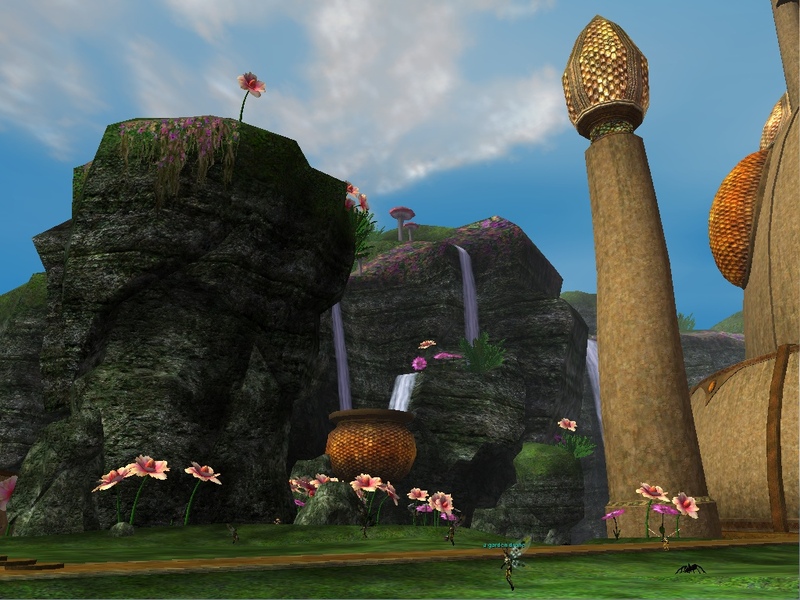 This zone is the most incredibly pretty zone - it rivals the Brownie Village area in SoF zone Dragonscale Hills - and possibly the smallest in all of Norrath. I have to agree. I'm even having an in-game wedding here. Before going to SH, it's a good idea to run through all the bixie quests that are given in the moors so you'll be able to complete the ones in SH all at once. 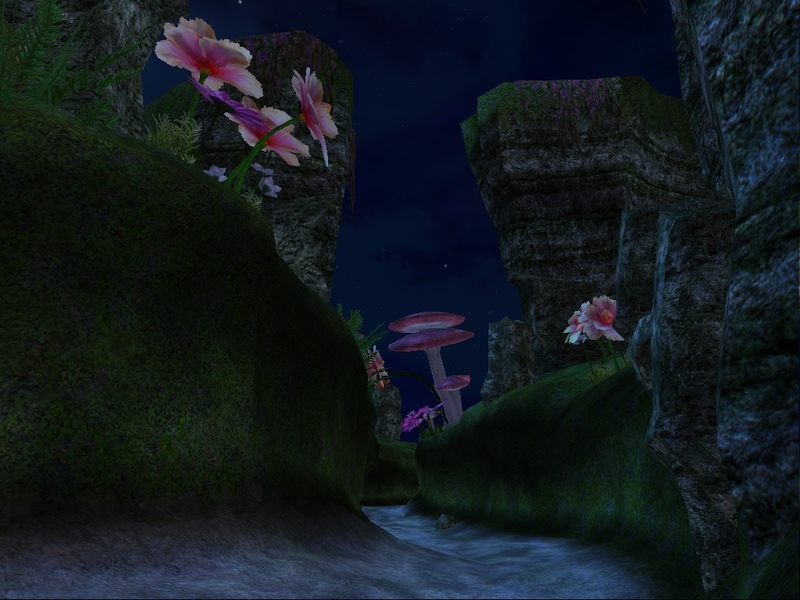 All the bixie quests come from the group of drakkin camped north of the PoK book in a little swamp. SH is directly east of the PoK book, just run straight up the hill to the east and you'll be in the bixie valley. From there you run along the left wall to get to Stonehive. Things that will aggro on you in the moors are: the Moorwalker, the waspherders, and any wasps. Take note- most bixies in the moors will not help out the wasps BUT THEY WILL IN STONEHIVE. There are a few other things in the bixie valley that may aggro, but you'll avoid them if you stay to the left. once in SH, you'll be at the end of a long valley completely free of mobs. I would NOT recommend pulling to the tunnel, as all of the mobs near it will add, leaving you fighting 3 mobs at the very least. Instead go into the hedgemazes where there are several areas at dead ends where you can get a single spawn with no chance of adds, and a few where you might get one add. 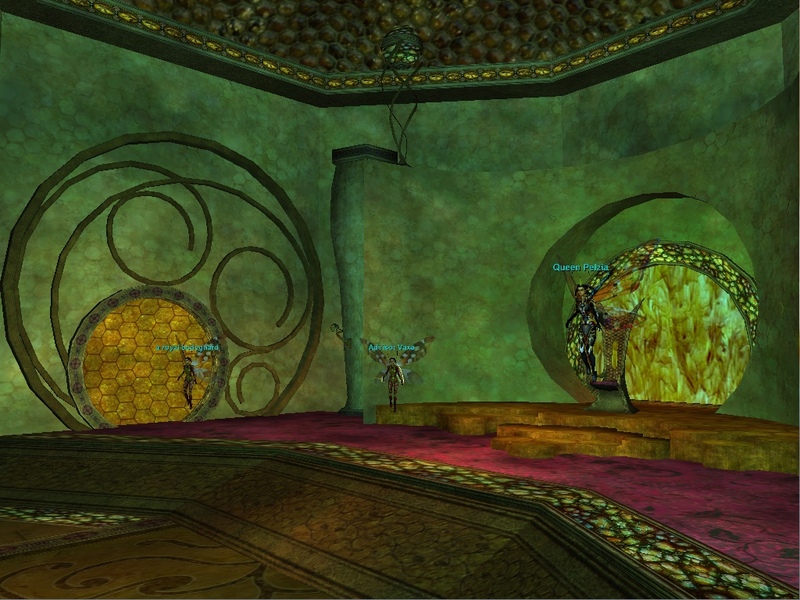 In the right hedgemaze is the Bixie Imposter, who sells enchanter spells and is on CR faction. Also in the right maze is the Preserved Kithicor Leaf, which can be given to the librarian in CR to improve your SS charm. In the right maze I found Fluermielle, a named horse which is the only mob in the hedgemazes who's Scowling. Because of this, I would recommend taking the right maze rather than the left. Beyond the mazes are the yard and the hive itself. The yard is like the mazes in that most of the mobs will not attack unless you attack first, but the flower mobs will attack if you /open the "a fungus patch"s found in the yards (the reason you would bother to /open them is they sometimes have the plants for the botanist's quests- more on quests later). once they attack, any other mobs nearby will add. 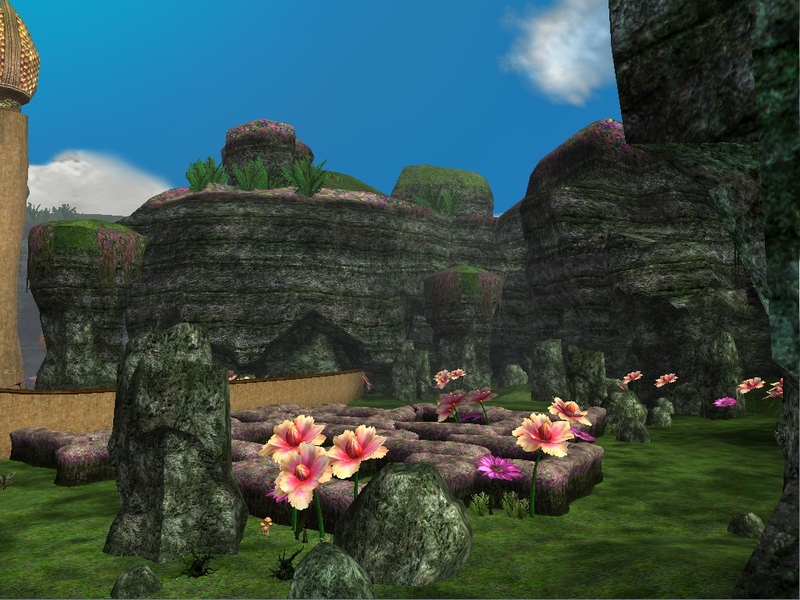 The yard is the home of the Enchanted Shrubbery, which is used for one of the drakkin breath quests, and can be found in a valley to the right of the hive hanging out with about 5 other walking bushes. at the end of the yard is the hive, where all the mobs are scowling. the 1st floor is a circular hallway with a big room with stairs to the catacomb and 2nd in the middle. the mobs in the hallway consists of pairs of mobs guarding arches along the hall, and single mobs who patrol throughout. there as mini tunnels in between the hallway and the center room where nothing spawns, so you can rest there if needed. I've never gone upstairs in SH, so don't have anything to say on it. I might add more here if I go back. On quests: the rewards are okay for the level you can get them, and since a lot of them have effects VS bixies, they're pretty worthwhile if you're going to stay in Stone Hive. parts for the cook's quests drop only in the hive, while the parts for the botanist's quests only drop outside the hive. however, I would NOT recommend the botanist's quests, which reward you with potions that aren't as good as the ones you can get from 'Hardy Seeds' and 'Blightfire Witchlamps'- So don't bother to pick up the no drop petals, sap, and seeds. items that are good to pick up as merchant fodder are bixie meat(11pp), spider mandibles(7pp), and shambling vines/vegetables(10-14pp). Most of the mobs outside the hive, bushes, bixies, skellies, etc are con Dubious. The closer you get to the Hive Building, the worse the faction. This zone seems a pain to break in. Tons of adds everywhere, at least up front. Any suggestions? so if i can get to this bixie i can just "buy" the spells I need, or do I have to complete quests and / or earn some sort of "rune/scroll" and trade it for a random spell? Sassinya 75 Chanta High Elven Kind .. Seventh Hammer, http://eqplayers.station.sony.com/character_profile.vm?characterId=515396118453. Melui Blaydz'Saver 72nd High Elf Cleric, Seventh Hammer, http://eqplayers.station.sony.com/character_profile.vm?characterId=515396124131. Mobs found in this zone. Queen Pelzia – does not summon, no change to run speed allowed, has about a jabillion hp, drops ring of the bixie queen. (Tethered or just a bug) On 3rd level in the bixie hive at +71, -131, +413 respawn in 1 hour. Spawns “5x a bixie swarmer” and 10x “a young grub”. a bixie swarming is teathered also and despawns at the end of the fight, a young grub does not and is not teathered. Neezzee – Mob for warwing wendiez quest. Respawns in 20 minutes or so. Spawns at -151, -16, 408. Bixie War Plans – grownd Spawn at =183, -12, 409 next to neezzee. 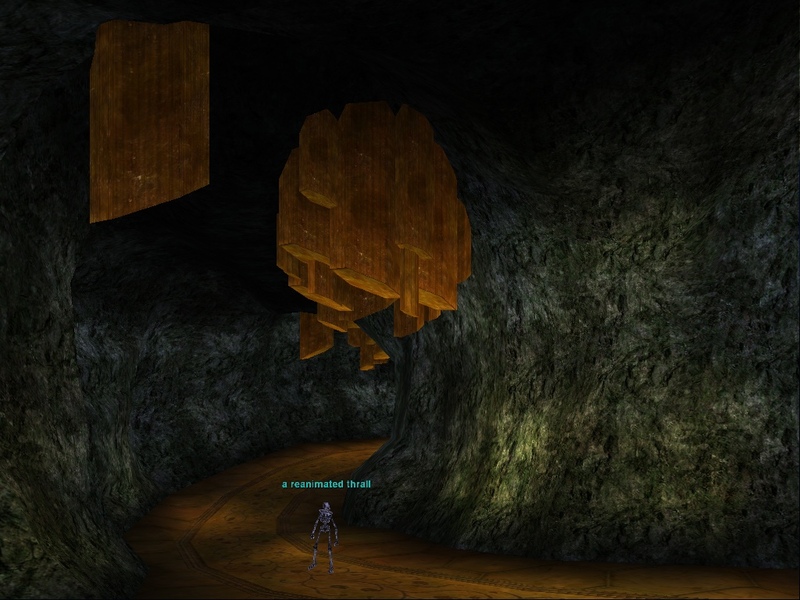 Arcanist Moxia – spawns on 2nd level, drops bixie wing, bixie meat, Shroud of Greater Transmutation. Advisor Vaxa – Loc is (next to queen). Drops Bixie parts, bixie wing, Scourge of Dismemberment. 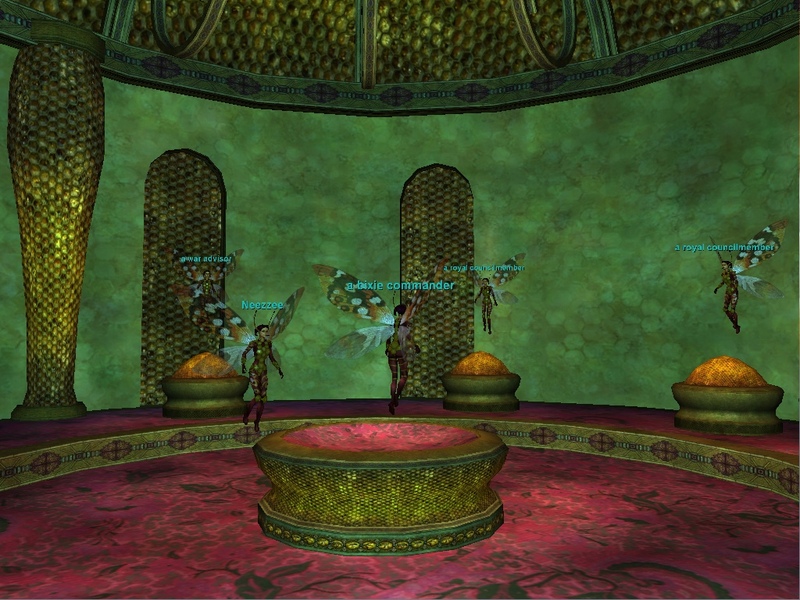 Warwing Wendiez – 3 quest, 1 right afeter another. 1st quest – “Who’s Who” (note: you can not skip any part of this series). Rewards are 1 of 3, your choice. Ok am hunting the Poison Maker and not sure where the lock is on this post. On the second floor i am camped near the jails, do I go up the honye come ramp or what, I saw an elevator up there, I have gotten two lvls hunting her so I am pretty sure I am in the wrong place, please help. Just about all of the MOBS were grey on my Druid tracker (I am level 63). There is a giant "hive" building, a lake you can fish in. But the MOBS seem to be all aggressive - scowling to me, and hit pretty hard for what I am used to for former greens. There is a Red Drakken named Warwing Wenlez at -518, -264 outside the hive and near the lake. He cons indifferent to me and would not respond to my hails. a finiky flower drops tradeskill items and quest items (bulb lotus, sweet lotus sap, raw runic hide. Showing 25 out of 148. Click here for the full list.